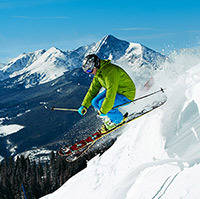 Vail is consistently recognized as one of North America’s most exciting and vibrant ski towns, not only for its amazing terrain, but because of the diverse arts and entertainment options. There is something for everyone including a wide variety of bars, clubs, and restaurants in addition to the amazing cultural opportunities and events all year round. Vendetta’s – Featuring pizza by the slice, this is the hang out for Vail’s ski patrollers. Located in Vail Village on Bridge Street. The Bully Ranch – A local’s favorite! Be sure try a “mud-slide” drink and enjoy the true Colorado Western cuisine and barbecue. Located in the Sonnenalp Resort in Vail Village. The Red Lion– Live music and a great deck make this a perfect apres ski venue. Get there early to claim a prized spot on the front deck. Located in Vail Village on Bridge Street. Garfinkel’s– Offers a large deck for apres-ski and nightly specials. Located in LionsHead near Eagle Bahn Gondola. Los Amigos – With one of the best decks in Vail Village, this Mexican restaurant features great margaritas and the perfect viewing area for watching skiers come down Vail’s famous Pepi’s Face.